As we near the halfway point of our externship with Team Echinacea, it’s time for a progress update! 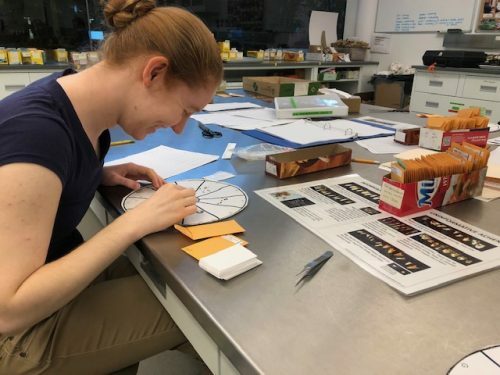 Julie, Tris and I have been knee-deep in data collection for the past week and a half: this includes both the “ACE” protocol with Echinacea achenes (cleaning, re-checking, scanning, counting, randomizing to create X-ray samples) and similar processing with Liatris and Solidago specimens. We quickly learned that the pappuses (papi? – the fluffy bits designed for wind dispersal) of Liatris and Solidago achenes adds a new level of difficulty to the counting and randomizing processes. Any air movement–including breaths–can cause major disruption to our work spaces, and the achenes themselves are often frustratingly small. Though we finally made it through the Liatris samples by the end of last week, with this week commenced the Great Solidago Counting Problem of 2018. With minuscule achenes, of which there may be many hundreds on any given sample, Solidago is not easy to work with–especially when you’d like to estimate achene count per plant. We spent much of our afternoon workshopping several methods of estimation and randomization with Lea and Stuart, hoping to make the process as efficient as possible while also providing reasonably accurate achene counts for Lea to use in her ultimate data analysis. Our final method (still subject to change and optimization) consists of counting the number of heads on each sample, then randomly selecting five heads from which to count achenes. This way, we can extrapolate average achene count per head to the number of heads, then to the number of total florescences of the plant. We hope to power through the remainder of the Solidago samples within the next few days, then begin analysis of all the data we’ve collected!